It seems to me that finches are often “short-changed” when it comes to cage space. Their small size, especially when compared to other pet birds, seems to pre-dispose hobbyists to providing equally tiny living quarters. But the facts that a bird “fits” in a cage, and can move about somewhat, does not necessarily mean that we are providing it with an ideal environment. Rather than using your pet’s size as a factor in cage choice, I propose instead that you carefully consider its habits and natural history. 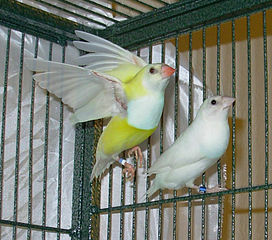 For example, finches do not climb about as do parrots, and hence cages offer to them much less “useable space”. 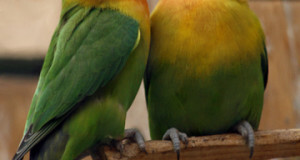 Whereas a parrot might clamber over every inch of its home – roof included – finches use mainly flying and ground space. Also, finches explore and will utilize toys, but not to the extent seen in most parrots. They spend more time foraging and otherwise moving about, and hence have little to “occupy themselves” in a small cage… space therefore is key to their well-being. Then too, many finches tend to be high strung, and are ill at ease when closely confined. It is very hard to hand-tame finches, or to induce breeding in tight quarters. 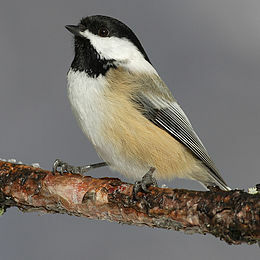 As most finches are not given outside flight time, cage size and complexity are important factors in their husbandry. At just over 5 feet x 2 feet x 5 feet, the A&E Double Flight Bird Cage is the ultimate in luxury housing for finches. Available in 6 colors, it can also be divided to allow for introductions or when separate facilities are otherwise needed. The .5 inch bar spacing renders this cage ideal for even the smallest of finches, but its design also permits the accommodation of cockatiels, parrotlets, lovebirds and parakeets. The Double Flight Cage is an excellent choice for those seeking to provide finches of any kind with additional room, and is perfect for housing larger species such as Gouldian finches, bull finches and Java rice birds. You can also use this cage to create a striking mixed-species display for compatible birds such as cordon bleus, golden-breasts and painted finches. Additional space always improves ones chances of breeding captive birds. Ample room is particularly important for shy finches, and for those that become lethargic in small cages and reproduce most reliably in group situations (i.e. yellow-rumped and gray-headed munias). For many of the more sensitive finches, a large flight cage is the only reasonable alternative to an outdoor aviary if breeding efforts are to be successful. The Double Flight Cage is equipped with 2 doors that allow for the installation of nest boxes. Nesting sites so situated are outside of the cage and therefore will not restrict available flight space. My most memorable observations of captive finches have taken place before large cages and outdoor aviaries. 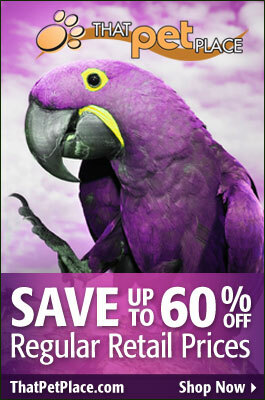 If you are serious about your birds, please consider providing them with as much space as possible. Working with mixed species collections is a favorite pastime of mine, and one that hooks most who give it a try. Click here for more information concerning finch species that forage together in the wild. Image referenced from wikipedia and originally posted by Jason L. Buberel. Hello, Frank Indiviglio here. Thanks for your interest in our blog and your kind comment. Please feel free to write in with any questions, comments or observations you may have. Thinking about getting a double flight cage for 6 finches (society, zebra or gold breasted wax-bills) such as the A&E Double Flight Bird Cage but want to be able to remove divider and have it set up as one cage. Most websites for finches state that longer is better but my husband and I are concerned that removing the divider would make the opening between the two separate cages wide enough for the finches to go through. Is this actually going to be a problem if we remove the divider permanently ind a double flight cage and set it up as one long cage for finches? Also which double flight cage is recommended for finches if we set it up as one cage without the divider?